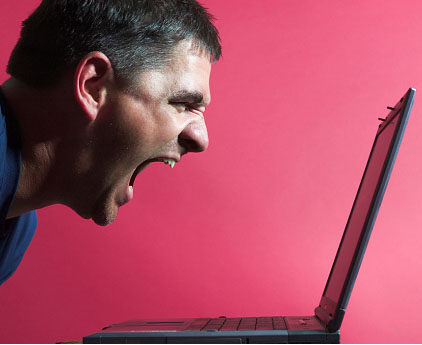 Site Speed For Dummies Part 1 – Why Bother?.. Since starting in SEO, I have followed countless numbers of blogs and read a huge amount of information (most of which I don’t understand). What I always found irritating was reading a blog post, knowing the actions you need to take but lacking the technical know-how to put those actions in place. Take site speed, for example. Site speed is a funny old thing. Ever since Google first announced in April 2010 that they were using it as a ranking signal, everyone has known that they need to optimise it. The problem is that most people just don’t know how to do it (like me: personally, as soon as I see code, I run for the hills). To that end, this blog post is for all those SEOs out there that know they should be improving site speed, but instructions like “combine images into CSS sprites” means nothing to them. Originally this was going to be one blog post, but after researching it’s turned into what will likely be three posts. Part one will cover the reasons behind wanting to improve site speed, part two will be getting down and dirty with all the techy code stuff and part 3 will be how you can actually get developers and customers to buy into it and how to influence change. Is it better for the user? Is it better financially for the business owner? Does it result in higher natural search engine ranks? So we already know that people prefer to surf as fast as possible, but since we are geeks, we need proof, right? For starters, Google, and in particular Larry Page, are obsessed with speed. Have a look at this article on the BBC (from 2009). The “Fast Flip” concept is mentioned, where we Twould be to be able to flip through online content as quickly and easily as we can with a physical magazine. Additionally, Google themselves ran a test to see if slowing down the search process effected users' behaviour. They essentially made Google slow down very marginally for a set period of time. They had two groups: a control group, who use Google as normal, and a test group. The test group's searching habits were monitored over a period of 6 weeks while delays between 100 - 400 milliseconds were applied to their search environment. The test simply showed that the longer the delay was, the fewer searches people were likely to do. The impact ranged from 0.2% to 0.59%, and what’s even more interesting was that in the longer delays, even after they returned to Google’s regular fast speed, they maintained their newly modified search habits. Put simply, the effect of a slow user experience changed their search habits for an extended period of time. Bing also found that a 2-second slowdown changed queries per user by -1.8% and revenue per user by -4.3%. That’s pretty amazing. These numbers might not seem like a big difference, but think how quick Google is already: if we were dealing with a site with delays of 4 or 6 seconds, this could have a much bigger impact. So I think that answers the first part. Yes, a fast site is definitely better for the user... duh. 2. Will a fast site make you more money? So we now know that it’s better for the user, but do happier users actually make us more money? Is improved site speed worth implementing? I dug around a little and found a great article, Velocity & The Bottom Line, which has some great case studies that are worth having a look at. I picked a couple that are great examples of how site speed can affect your bottom line. 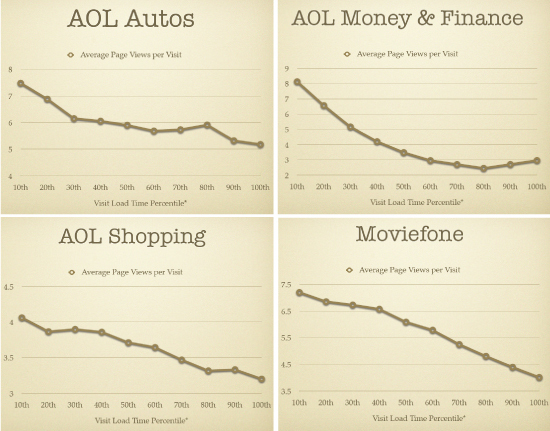 AOL conducted experiments to see how their site speed effected the way people viewed their site. For each visitor, they monitored the average load time of the pages. They then broke this down into percentiles of the highest to lowest and examined the number of page views of each group from fastest to lowest. This showed some nice numbers across a range of industries. As you can see from the image above, the faster the site is, the more pages the user navigates through. This is true across all the areas of the site shown. More site views on a site like AOL is very important as more page views = higher advertisement revenue. Another site which is used as a case study in that article is Shopzilla. If you are not familiar with Shopzilla (I wasn’t until writing this), they are a product comparison site which allows you to compare prices of products and help you get the best deal. They got some great results from speeding up their site and even in some aspects that you would never expect. Before the change, their site was averaging a load time of between 4 and 6 seconds per page. After making the changes they were averaging less than 1 second consistently, and this had a dramatic overall effect. feel more secure. Since they don’t have to wait about as much, they don’t have time to panic when they hit the buy button. Can you imagine the testing you would need to do to achieve a conversion increase of 7-12%? Then what about the infrastructure costs? 50% is huge, especially with a site this size. Most small businesses won’t have such high infrastructure costs, but it’s still interesting to know that money can be saved in areas you don’t expect. This is the ideal situation, as sales increase + operational costs decrease = WIN. I think you would agree this shows that faster sites can definitely increase your bottom line. 3. Does it increase your search rankings? The short answer to this is yes. Google have publicly said it’s a ranking factor, so improvement here will definitely increase your rankings. What’s not to clear is how high up your to-do list it should be. According to Google, in April 2010 search speed affected only 1% of queries. That’s not a huge result, but I think we can assume that this number will increase over time. But if there's still doubt, I always refer to common sense. Browsing at speed is better for user experience, therefore Google should prefer fast speeds. Building on that, the following is based on my opinion and has not been tested, although I welcome anyone to test and let me know the results. These are all excellent things from a user point of view, which is obviously Google’s number one priority. And a close second is making money. When you look at the size of Google’s Adsense network, for example, do you think they would be in favour of getting a 25% page view increase across the network as a whole by way of increasing speed? Of course they would. Results that big could mean millions of pounds every year. It also makes sense that Google would track site user stats as well. If a site gains all the above stats, that site deserves to rank higher. I think the secondary increase in relevancy and user experience would drive the increase in rankings, rather than the primary increase in site speed. It’s all about the big picture in my opinion. I hope this first part in the series has given you a sense of the reasons why site speed is important. If anything, perhaps for those of you about to build a site, I've shown why you should future proof your site by getting site speed correct at the start. 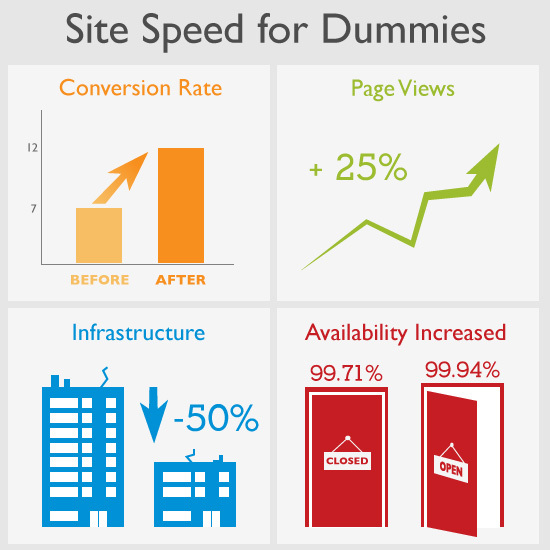 Look out for part two in this series of "Site Speed for Dummies". I’ll be getting into the real reason I started this post, how to actually make your site faster, side-by-side site comparisons and giving my recomendations on what to do and how to do it.